Among Civil War enthusiasts and scholars, Braxton Bragg has long occupied a place near the top of the list of generals we love to hate. Truth be told, he did a lot to earn the reputation both during his lifetime and after. But a reevaluation of his personality and professional capabilities by a reputable scholar is long overdue and Earl Hess is just the man to do it. Hess is a prolific author on many Civil War subjects with a well-earned reputation for shedding new light on long accepted theses. Bragg could not have asked for a more thoughtful, careful, and scrupulously honest evaluator. 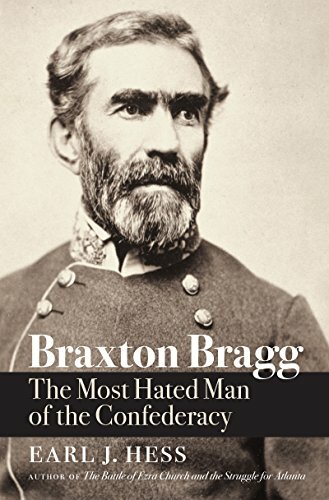 "Historians," Hess maintains, "have tended to see Bragg as the actor in creating a circle of negativity around him, but we also must understand that he was in turn deeply affected by the actions and opinions of others." Fortunately, Hess has never been awed by pedigree, either from the subjects he investigates or from fellow historians with whom he spars, intellectually of course. This tends to make him a lively and informative read. The book is an investigation of Bragg's military career, not a full blown biography. Nevertheless, Hess makes clear that Bragg's wife Elsie was the staunchest--and sometimes the only--source of emotional support for him. Bragg's inability to form personal attachments and accept the limitations of others haunted him throughout his military career. "He saw life in black-and-white terms," Hess posits, "had scant ability to accept the complexities to be found in others, and possessed a stubborn streak that served him ill in his relations with subordinates." The breadth of Hess' expertise allows him to analyze carefully Bragg's abilities on the battlefield, both as a tactical commander and as the commanding general of an entire army. Bragg fought with distinction at Shiloh although he can rightly be criticized for inserting his units piecemeal into the fray. Hess believes that the troops of the Army of Tennessee did some of their best fighting under Bragg's command at Stones River. At Chickamauga, the Army of Tennessee was at the height of its powers and achieved one of the Confederacy's few tactical victories in the West. Nonetheless, Hess boldly writes, "The sad truth was that all three of Bragg's corps commanders--Polk, Longstreet, and Hill--were willful, unreliable subordinates who could not be counted on to obey orders or to cooperate with their commanders." Not surprisingly, this nest of vipers spawned the revolt of the generals that spread through Bragg's army and percolated up to the attention of President Jefferson Davis. Bragg never fully recovered from this attempted coup de grace. Too many historians, Hess believes, have relied on negative observations and conclusions offered by Bragg's subordinates and which were repeated in newspapers of the day and, as a result, have become cemented in the historical record. Hess, on the other hand, sees Bragg as "an officer of undoubted qualities" that included being "hardworking, meticulous, detail-oriented and extremely self-disciplined." Of course, those same qualities can be attributed to someone who is overbearing, petty, and reclusive. Bragg has often been seen that way as well. Hess writes with an easy grace born of erudite scholarship and years in the classroom challenging fresh eyes to look upon old stories and interpret them in new ways. Readers may or may not come away with the same interpretation of Bragg as Hess posits, but it is hard to argue with his final assessment of the general: "Bragg was a fascinating mixture of good and bad qualities; his impact on Confederate history was enormous, and we are still grappling with it." Clearly Hess makes no claim on having the last word about his subject. Good historians never do. Gordon Berg is a past President and member of the Civil War Round Table of the District of Columbia (www.cwrtdc.org). His reviews and articles appear in the Civil War Times and America's Civil War, among other publications. The Round Table invites you to submit reviews or interviews for publication on this site. Please send an electronic copy of any materials you would like considered to admin@cwrtdc.org. Please include a short biography, if you would like it added at the end of the post. Welcome to the website established by the Civil War Round Table of the District of Columbia. Please visit our home page at http://www.cwrtdc.org/ or contact us at admin@cwrtdc.org for additional information about the Round Table or its various events. The Round Table meets on the second Tuesday of the month from September to June at the Fort Myer Officers' Club, Patton Hall, 214 Jackson Avenue, Fort Myer, Virginia, 22211 (in Arlington, VA) or at a nearby location (see https://jbmhh.armymwr.com/programs/patton-hall). Its meetings include dinner, followed by a speaker who will present a topic related to the U.S. Civil War. The Round Table also sponsors field trips, tours, and other events with noted Civil War authors and scholars. Its purpose is to further and to stimulate interest in the history of the United States and particularly the Civil War. Disclaimer: The statements made on this site are the opinions of, and published by, the authors and reviewers and are not the opinions or publications of the Round Table. The Round Table's role in supporting this site does not constitute an endorsement of the authors or reviewers, their opinions, or the organizations represented or referenced by the authors or reviewers. This website is presented for educational purposes only. Website maintained by CWRTDC (admin@cwrtdc.org). Picture Window theme. Powered by Blogger.